The PIOMAS data for August 2013 has been out for a few days, so I'm a bit later than normal (work + a cold), but it's now time to review the summer and look at prospects for the coming freeze season. PIOMAS anomalies from the 1980 to 1999 show that this summer had the same spring melt as the other post 2010 years, but this year it was muted. Later in the summer the melt followed a similar trajectory as those other three years, but at the end of August the melt was even less than average, leading to the anomalies heading upwards more sharply than the average. 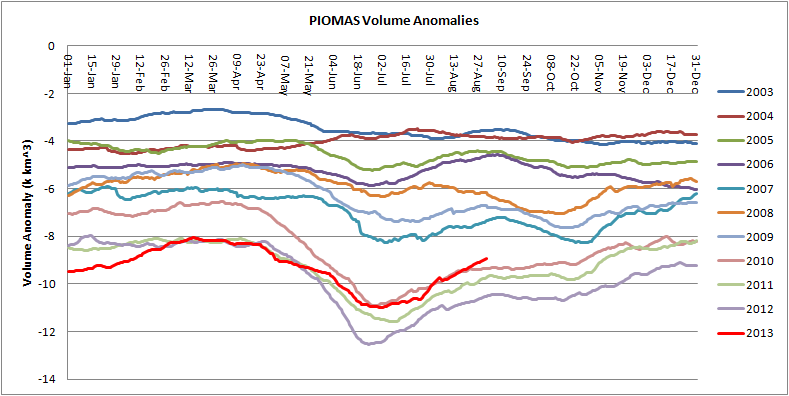 As can be seen from the anomalies, the current PIOMAS volume is closer to 2010 than other post 2010 years, and is now slightly above that of 2010, but the impact of the 2010 volume loss remains and has not been wiped out. The spring melt nominally runs from 20 April to 29 June (days 110 to 180), PIOMAS volume losses for this period show that 2013 was one of the fourth largest losses, behind the other post 2010 years. 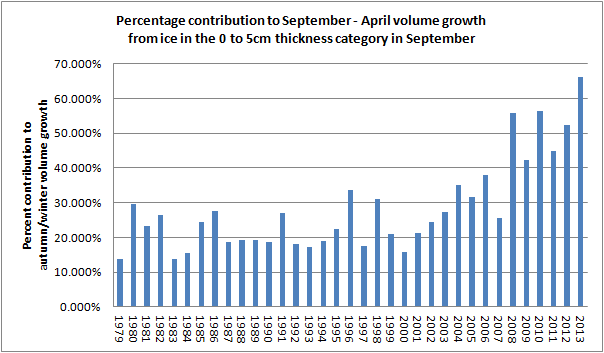 So despite weather conditions the signal of thinner ice conditions brought about by the 2010 volume loss event was still apparent in 2013. The following figures are in 1000 km^3 and show the losses during the spring melt ordered in increasing magnitude. At the other end of the summer August losses were the lowest on record at 1.952k km^3, using the standard deviation (sigma) and average of the 1979 to 2012 period, August 2013 is a substantial 2.5 sigma below the average. However this isn't really an appropriate indicator because when ordered by magnitude the other post 2010 years all occupy the top four slots. So as can also be seen from the anomaly plot, while the 2010 volume loss event ushered in increased spring losses it also ushered in reduced August losses, and whilst weather played a role this year, it fits that pattern. It seems reasonable to view this August as an exacerbation of a pre-existing tendency due to weather. 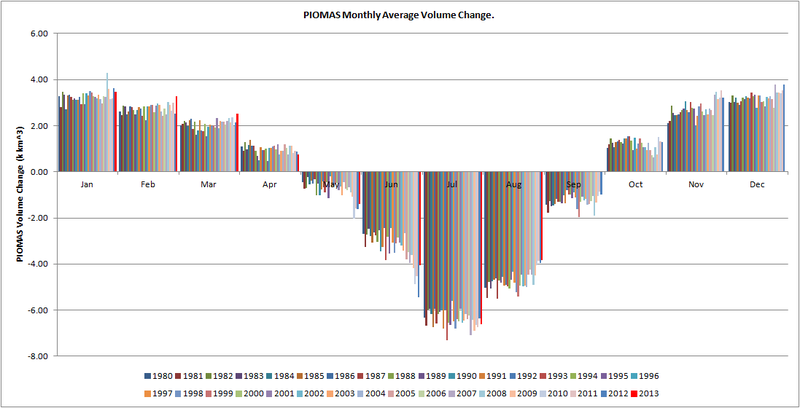 That August losses were low can also be seen from the plot of monthly PIOMAS volume changes. For completeness, as I've shown it before, here are volume losses broken down into ten day increments updated through August, link. 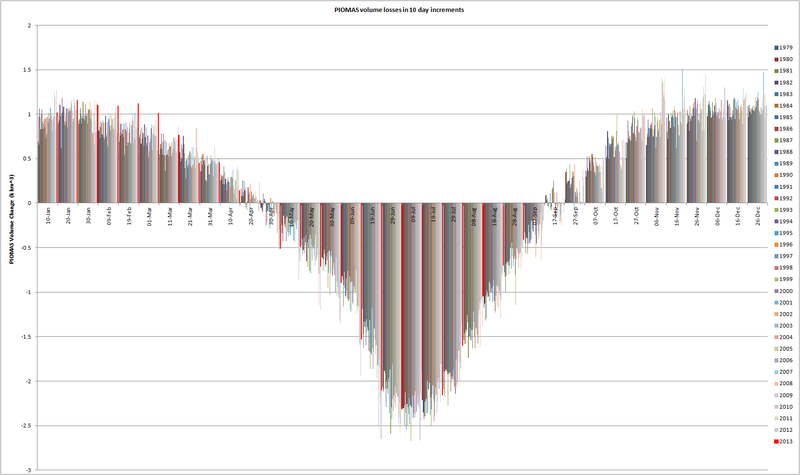 So as is to be expected given area and extent indices, the summer of 2013 has lead to an increase in volume. A key question is what effect this will have on the winter maximum volume and thickness leading into next season. This will in turn determine how long the memory of the 2013 melt season persists as a major factor in the ice/ocean system. If we see a substantial gain of volume over the coming winter it could make the 2015 +/- 3 years prediction from naive trend extrapolation look overly aggressive. Although of course there is another major factor that may invalidate the trend extrapolation approach (the thickness/growth feedback). 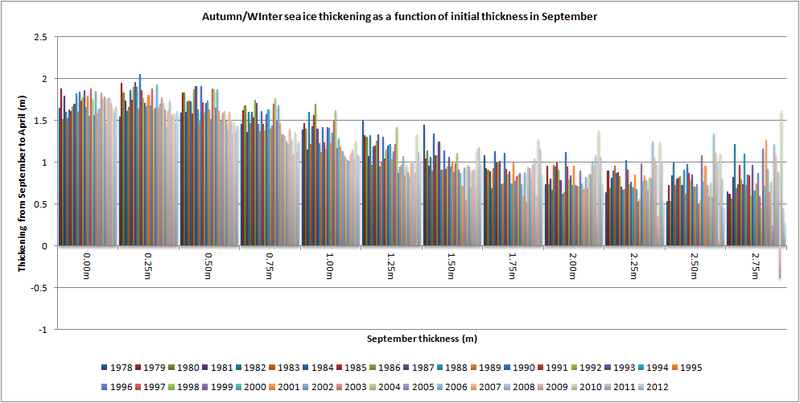 Currently, despite increased volume, thickness is still of the same order as the other post 2010 years as shown in this PIOMAS team plot (I can't work out monthly average thickness during the melt season as this factors in concentration, which has not been updated through the year). Critical to getting some idea of how much volume gain we can get in the coming freeze season (September to April the following year), is what is changing with regards volume gain at this time. 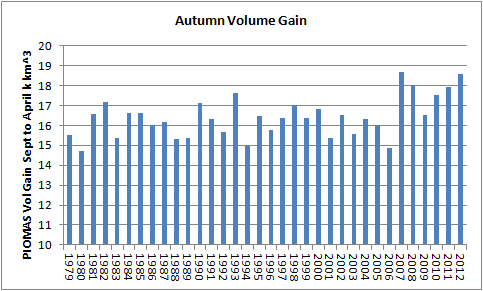 The graph below is entitled Autumn Volume Gain, it actually applies to the gain in volume from the minimum of the stated year to the maximum in April of the following year. Post 2007 the volume gain during the freeze season has increased. This is because of increased growth of new ice from increased open water at the end of the melt season in September. This increased growth can be seen in the following graph, which is calculated from PIOMAS gridded data, with each year being the year of the sea ice minimum preceding the freeze season. The percentage of total volume growth which is accounted for by grid cells with a thickness between 0cm and 5cm in the September average has increased massively post 2007 reaching a peak of 66% of total volume gain after the 2012 record minimum. 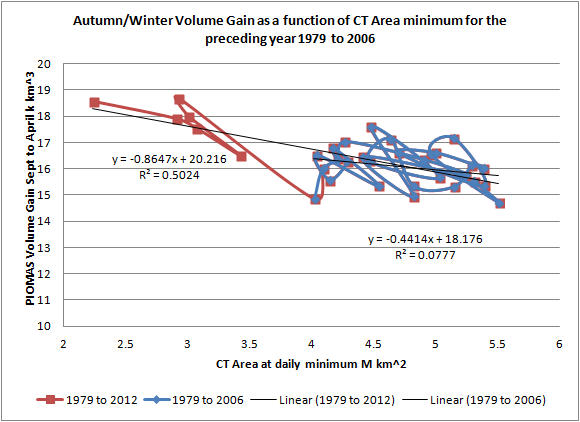 This response to the new regime of lower summer minima can also be seen in the relationship between CT Area and PIOMAS volume gain over the following autumn/winter. 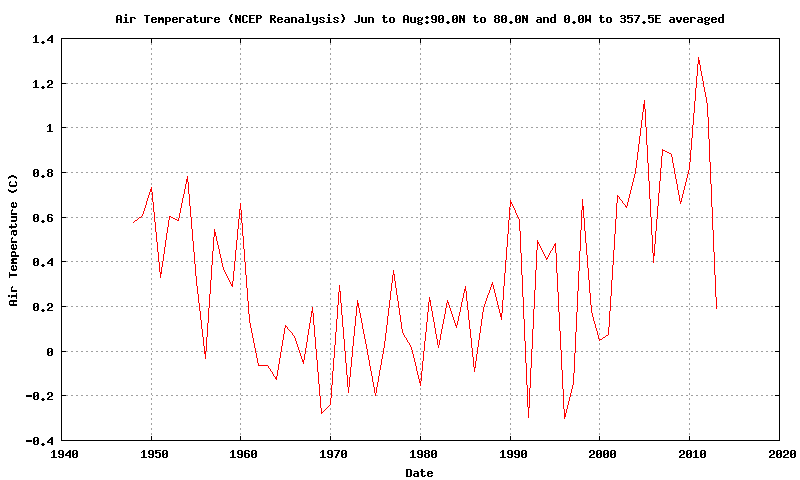 The fit for the 1979 to 2006 period explains little of the variance (R2 of 0.08) indicating a weak role for minimum in setting the ensuing freeze season volume gain, and a dominating role of weather (random variability, up and down). However when bringing in the post 2007 data the explained variance increases (R2 0.50), indicating a stronger role for the preceding summer minimum. This is explained by the preceding graph of the amount of growth from open water (0 to 5cm grid box effective thickness being virtually open water) and the thermodynamics of ice growth. Sea ice grows by heat flux through the ice causing ocean to freeze to the underside of the ice, thus thickening it. As this process continues through the winter the ice, being a good insulator, reduces the heat flux through it. So as the ice thickens the rate at which new ice forms on it base reduces. 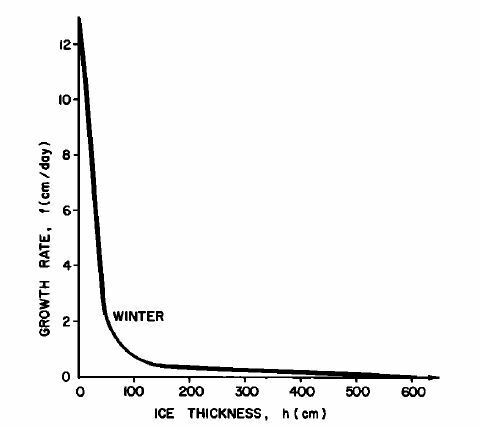 This has a strong effect on growth rate as shown in the following figure from Thorndike et al, 1975, "The thickness distribution of sea-ice." So for very thin ice, or growth from open water new growth of ice is very vigorous. This is reflected in the PIOMAS model. Using PIOMAS gridded data I have calculated the thickening as a function of initial September thickness, for each year the year is for the minimum, growth to the following year's maximum is plotted against the minimum that preceded it. The area covered is the whole region north of 70degN, so the thickness of ice growth in the 0m and 0.25m September thickness categories is brought down by thinner peripheral ice. This effect can be seen in plots of April thickness, where within the pack ice has grown from open water thickness are more typically 2m, e.g April 2013 a year with the greatest growth of first year ice from open water, link. It can be seen that while thickening of open water and near open water (0 to 0.5m September thickness) leads to 1.5m to 2m thickness growth, as the initial thickness increases, so the thickening falls. As we get to ice over 2m thick processes such as transport and ridging play a greater role, together with reducing volumes of ice with increasing thickness, this leads to increasing variability in recent years which is a greater proportion of total thickening. The variability increases substantially in excess of 3m initial thickness. The gridded thickness data used are 'effective thickness', which is the thickness to which a sub grid thickness distribution is applied to simulate ice processes at smaller scales than a PIOMAS grid box. If the sub grid thickness distribution is applied to ice thin enough it would produce negative thickness, should this occur the negative thickness component is handled as open water (zero effective thickness), so a grid box with a thickness of as little as 0.5m can be viewed as a grid box containing ice floes in water. Thus when refreeze happens over winter it would exhibit a great deal of vigorous thin first year ice growth. So what does this rather substantial side-track mean for the coming winter. As shown in the third graphic of this post the thickness is similar to 2010 to 2012, being something like 40cm thinner than 2009. 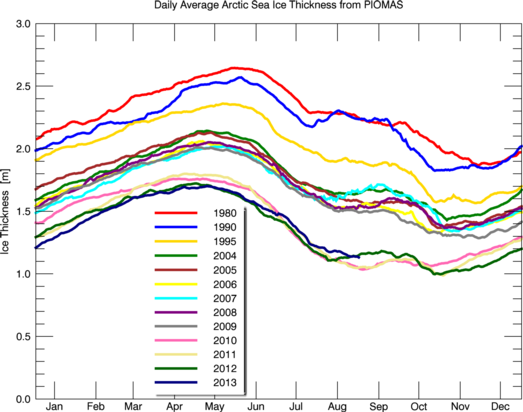 But much of that difference is due to the loss of thicker ice in 2009. We have wiped out the volume losses of the last three years, and CT Area is at 2009 levels. However a gain of volume like 2009 is highly unlikely because that year's volume gain was reduced by the start of the 2010 volume loss event. A gain of volume as high as 2007 or 2012 is unlikely because in 2007 the event was well below the local thermodynamic equilibrium (as discussed in the previous post), and 2013 has far more ice than 2012 at the end of the season. So something similar to the other post 2007 years seems likely, which would place April 2014 between April 2010 and 2011. But I'm not making any 'formal' statement on this, or attempting a prediction, until I've seen some PIOMAS gridded data. That data has been updated a couple of times this year but I don't expect such informal updates, the PIOMAS gridded data doesn't usually update until January for the whole previous year. "Throughout the season it has been tempting to view cooler temperatures as causing reduced melt, but less sea ice (meaning more open water) may be what is driving temperatures upwards, and more ice this year may have suppressed temperatures. Despite the lack of relationship between SLP and June loss shown above, there is a relationship between temperature and June loss, but this may be caused by sea ice loss, not causing sea ice loss." Note that I currently think the cold conditions in May could be pivotal: Causing an early retarding of volume loss, and a late start to the melt season. I suspect that the consequent late opening of Siberian waters may be the reason for the failure of the summer pattern and the subsequent cyclonic dominance. And the cooler conditions in May do not seem to me to be a result of presence of ice - recession within the Arctic Ocean hasn't started that early in the climatological mean (1981 - 2010). What Wayne points out regards anticlockwise (cyclonic) pack movement could have played a role. But note from my previous blog post that the scatter plot of SLP N of 70degN and CT Area loss in June does not support a role for pressure in June CT Area loss. July and August show similarly weak relationships. I've not yet done a post about the atmospheric role in the summer of 2013 because it's a matter I am still wrestling with. Sorry, forgot to add my disagreement with Wayne. "The great 2013 dispersal of sea ice masked the actual melt especially when using standard statistics." I don't think a melt has been masked- that PIOMAS shows a lack of loss of volume strongly indicates that there has not been a great melt of ice. I should add, since Flickr is now running and I have uploaded this image. On balance it seems to me that temperatures north of 80degN have been so low that to totally blame temperatures on more ice doesn't explain the cold. General atmospheric circulation has played a role. I did say I'm still thinking about this matter.